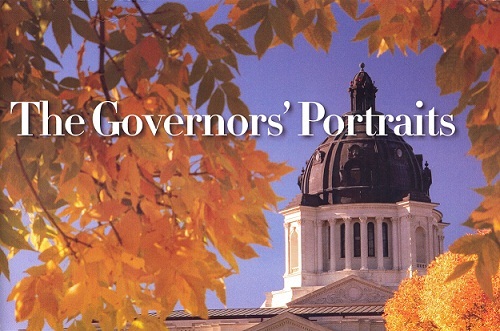 The Governors’ Portraits is the new chapbook from the South Dakota State Historical Society Press. Here’s the history behind the name chapbook: A chapbook is defined as a small book or pamphlet. Chapbooks were so called because they were sold by peddlers known as chapmen in England as early as the 1500s. As for the history of the governors’ portraits, each of South Dakota’s governors has been commemorated with a portrait hung in the halls of the state Capitol. The chapbook The Governors’ Portraits contains a photograph of each portrait, as well as a brief biography of each governor from South Dakota’s first governor, Arthur Mellette, to the current governor, Dennis Daugaard. The text was written by Dan Brosz, the curator of collections for the Museum at the Cultural Heritage Center. The new chapbook will first be available for sale Thursday during the Legislative Reception, and will be stocked in the Heritage Stores at the Cultural Heritage Center and the Capitol. Or buy it online by clicking here.